Former grand prix driver Rubens Barrichello has switched to US-based IndyCar racing after failing to find a drive in Formula 1 this year. The Brazilian, 39, the most experienced F1 driver in history with 322 starts, will drive for the KV Racing team. Barrichello had previously promised his wife that he would never race IndyCars because of the greater danger of their races on high-speed oval tracks. "I'll start as a rookie but I think I will get better," he said. The number of oval tracks on this year's calendar has been greatly reduced but four still remain, including the famous Indianapolis 500. Barrichello's decision will have been made harder by the multi-car crash at last year's season finale which claimed the life of Englishman Dan Wheldon. Barrichello reveals that it was his two sons who convinced his wife, Silvana, that their father should pursue a career in the US. "I said I didn't plan to because I hoped that I'd race in Formula 1 for 25 years. "My kids wanted to see daddy race on ovals so we had fun together. It was a set-up. "I briefed the boys and they went to Mum. They asked if it was true she didn't want me to race on ovals and she said 'I would rather have him race on normal circuits'. "Then all three of us said: 'Luckily, Mum doesn't tell us what to do!' It was funny. "She knows I'm happy. She can see it in my eyes so she is happy for me. "It was kind of funny - my kids helped big time. But she was fine." 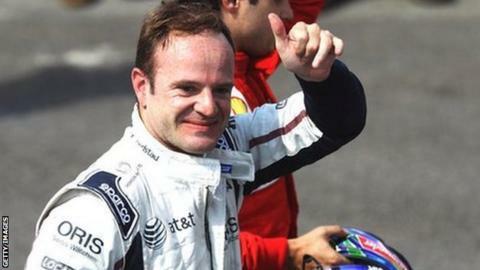 Barrichello, who won 11 grands prix in a 19-year F1 career in which he drove for the Jordan, Stewart, Ferrari, Honda, Brawn and Williams teams and has signed a one-year deal added: "I am thrilled. My main thing is to be an addition to the team. "They have been doing very well. Tony [Kanaan, a close friend of Barrichello] brought them to a different level last year, so I hope with my contribution we can build on this and take the team to another level. IndyCar has been struggling in recent years, with declining crowds and limited coverage on television in the US. Four-times champion Dario Franchitti recognised that Barrichello's arrival can only boost the profile of the series and strengthen the field. Via his Twitter account, Franchitti said: "Great news @rubarrichello is confirmed in @IndyCar. I think the competition level just went up again!!" Read more on A reluctant goodbye?